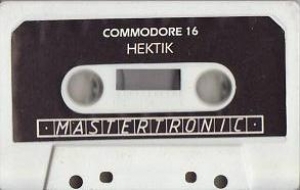 Hektik for C16 Tape Only, You are emtombed with the mutating monsters. Your only defence is your spade with which you can dig traps for them. Once you have trapped them you can push them to the level below and destroy them. As you advance the monsters become more vicious and if you fail to push them to the lower level they will mutate and become more difficult to destroy. 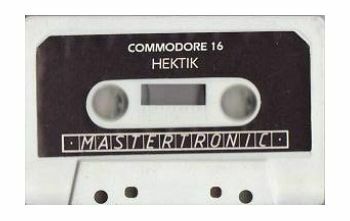 The mutations only start once you are into level 2 and continue through to Level 16 resulting in ever increasing difficulty. As the monster mutate in the following order Red to Blue then to Cyan, they become more difficult to destroy. Red requires to be pushed down 1 level only, the Blue must drop though 2 consecutive levels and the Cyan through 3. However, if you are skilful enough you can destroy them by dropping them onto of each other. Your only limit is your oxygen supply which is displayed on your screen.